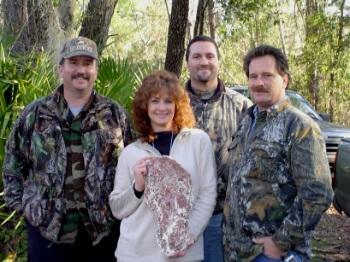 This first known cast in Florida of a possible sasquatch track was obtained in Lake County in 1980. This cast complicates the contention that southeastern sasquatches are substantially smaller than their northwestern cousins. The relevant detail in this cast does not show through distinctly in photos. Photographs do not do justice to plaster casts in general. They need to be seen in person to be fully appreciated. It was obtained by a retired county employee named Jim Bliss. 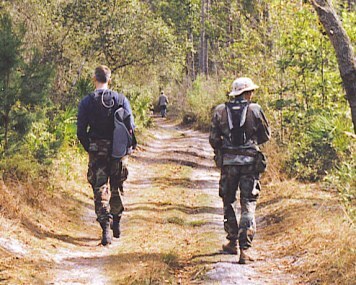 The track impression was found a few months after a spate of sightings that had been investigated by Lake County Sheriffs in the mid-1980's. Bliss was alerted to the track finds by some friends who were sheriffs deputies. 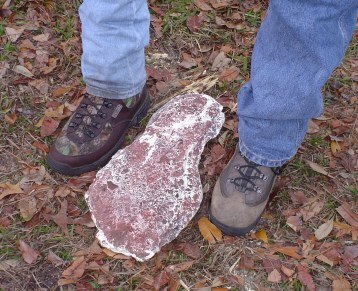 He found and cast this track less than a mile away from where other tracks were found. Bliss cast two of the impressions. This is the only surviving cast.The brown coloration on the cast is mud embedded in the plaster. Camcorder sprinters on patrol, heading toward the howl area. Click here for one of the recordings obtained at night. See the parargraph in the right column for details and circumstances. For two days the group had been making radio-coordinated knocking sounds and howl sounds, in a particular pattern, before the first howl recording was obtained. 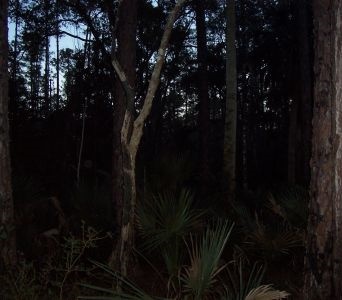 Central Florida woodland at dusk, when the first sounds were heard..
Summary: Several possible Class B incidents. A few sound recordings were obtained. One the recordings is available below. 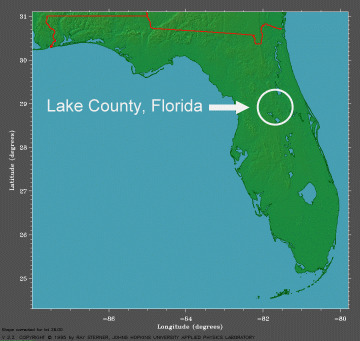 As far as we know it is the first howl of this type ever recorded in the state of Florida. Click here for the howl recording (courtesy of recordist Dan McGee). 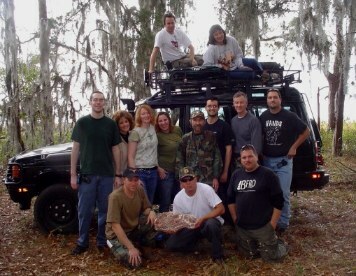 By the third night roughly 25 expeditioners converged on a particular area near a swamp in central Florida. They were spread out along a bay of the swamp on the north end, less than a mile from where sounds were heard on last year's Florida expedition. One of the howl recordings obtained is available below. It was the first sound recorded on the expedition. Compare the recording to the recordings of wolves (not common in Florida) and coyotes. Nearly all of the expeditioners heard this howl clearly from their scattered positions, across a mile long arc between arms of the swamp. In two separate zones, indicative sounds, including loud, patterned wood knocks were heard at some points by multiple witnesses. The sounds were not coming from submerged portions of the swamp. In both cases the sounds were generally following streams that were feeding the swamp, which also happened to be the areas with the densest brush and biggest trees. On the second night I heard what sounded like loud chatter mixed with a few whoops. It was around 6:30-ish. There was a 20-30 second exchange in the distance to my southeast. It definitely sounded like there was more than one of them, and it did not sound like a barred owl frenzy. I was the closest one to those sounds, and my recorder was not on (it was the first thing we heard out there), so I did not get a recording of it. I recorded the howls later. This was truly a great time, and well worth it! I have stories to last a lifetime, thats for sure. I would surely be interested in trying to make any additional expeditions that are stirred up in that area in the future, and will continue to stay in the loop with the crew. Obviously, being an 8 hour drive, it won't be a frequent thing for me, but I will try to make any I can. . . Perhaps the better outcome for me was learning so much about the process, so that I can do some of this type of investigation on my own (or with a group) up in the NC/SC area. I will try to identify some hot spots in the area, and if I can do so, then possibly we can set up an expedition up this way!!! Thanks BFRO for a great learning experience!! I just wanted to breifly salute everyone for a perfect first expedition. I wish it had been longer so that we all could have gotten to know each other even better. It seemed like the last day/night was the beginning of the end. I hope to see you all on next years (if not sooner) trip. The more I think about the brush charge incident when we first went in there, the more I feel that it was meant to intimidate us, rather than just something fleeing from us. I have jumped many deer in the woods & once a bear, when I lived in Wisconsin. As soon as they feel that you are too close they will bolt & they'll keep on going until they are at a safe distance. They make a commotion when they first bolt, but as they get going they get quieter, but you can still hear them in crunchy underbrush like that. This thing did not keep going. Whatever it was, it was obviously sitting there watching us at close range as we walked by. Then as soon as we made the whoop sound it bolted. It sounded as if it was heading right for us and then veered away. Also, it sounded huge, like a freight train coming through the woods. It must have crossed the road then just ducked down in the palmettos. It was probably laying low and just watching us. It might not have been a sasquatch, but it sure doesn't fit the mold of anything that I know of. I wish the others could have been there when that happened. It was awesome!